This healthy, easy to make chicken dish is yet another delicious weeknight meal option to add to your rotation. Less than 15 minutes of prep time and 20-30 minutes to cook means this flavorful one pot chicken dinner can be on your table in just under an hour; perfect after a long hard day at the office. Though chicken breast seem to have a lower fat content, I recommend using thighs in this recipe. The added fat of thighs keeps the meat moist and gives the dish a richer more distinct flavor. It also provides a nice sauce for the vegetables. This can be eaten alone or served over rice or pasta. Preheat oven to 425. Heat olive oil, in a large nonstick skillet that's safe for stovetop and oven over medium heat. Season chicken with salt and pepper and add to skillet. Brown chicken on both sides. Remove from skillet and set aside. Add carrots to the skillet and cook about 5 minute. Remove carrots and set aside with chicken Add garlic and cook until fragrant, about 1 minute. Add spinach, artichokes, and water and cook 1 minute allowing spinach to wilt. Add the chicken and carrots back to the pan and place in the oven to bake for 20-30 minutes, or until chicken is thoroughly cooked. This is a dish I would just love. Simple yet loaded with flavor, plus you made it with thighs, my personal favorite. This looks like pure comfort in a pot! Love meals like this! Looks yummy! I bet the thighs are very flavorful in this! I love one pot meals. they make life so much easier. Perfect for busy nights. I happen to prefer thighs so this is right up my alley. I love a meal I can make with minimal dishes, and especially one with so many veggies packed in! I'm a HUGE fan of one-pot or one-skillet meals. I love the easy cleanup! This could be a winner for my family, for sure. Looks like a wonderful and easy supper! YUM! I love chicken thighs. Beautiful recipe! Yum! I love crispy chicken and the simplicity of a one pot meal! 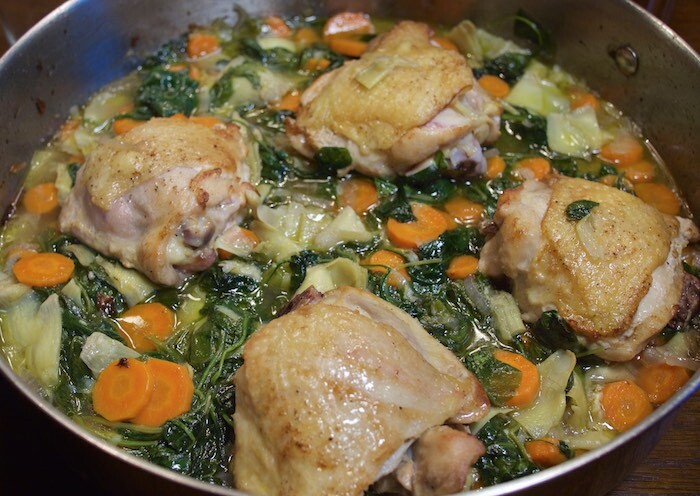 Love this one pot delicious chicken dish, have never cooked with tinned artichokes before but I bet they are fabulous here! Looks simple and yummy. great for those of us following Weight Watchers as well. Thanks for the great make ahead meal! I don't create a lot of one pot meals, but I definitely need to get on the ball and try this! Sounds great! I love one pot meals like this! Sounds delicious. I just adore one pot meals. This looks delicious! Super easy to make... super delicious to eat! Must admit, I am a big fan of chicken when cooked in pot. It develops a special and rich flavor... Thank you for sharing this recipe! I love, love, love one pot meals, and this one looks delightful. Love all the veggies in there! I can tell already my husband is going to love the flavors, and I'm going to love that it's one pot! Thanks for a great meal idea! Digging everything about this dish. Everything! First I would eat the artichokes! Mmmm! LOVING the look of this delicious one pot dinner!